This medieval story is entitled “The Falcon.” It was written by Giovanni Boccaccio and included in The Decameron. That lively, sometimes lusty, collection of 100 tales was told by 10 individuals: 7 young women and 3 young men, all of whom find themselves holed up in a secluded villa near Florence during the Black Plague (or if you prefer, the Black Death, a name that feels more final and less epidemic in its implication of mass mortality). The time is early in the summer of 1348. It’s not your typical summer vacation. 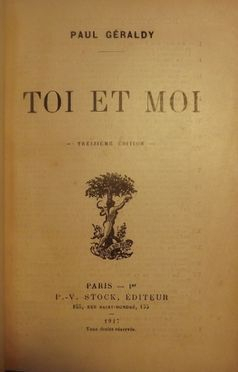 The author evidently enjoyed the use of Greek for the title which combines two Greek words, déka ("ten") and ἡμέρα, hēméra (“day”), thereby forming a term that means “ten-day” for the delightful (and purportedly diversionary) story-telling that takes place over the course of ten days. The translation of any work is crucial to its understanding and authenticity. “The Falcon” was translated in 1886 by John Payne in London; it was privately printed in 1895. As such, the work is the first truly complete translation of the Florentine language in the vernacular (the way ordinary folks speak). I happen to enjoy the earliest translations of any literary work because they tend to be closest to the source and have escaped the toxic fumes of historic and literary revisionism, political correctness and other baneful influences to any tongue, written or otherwise. “The Falcon” begins with the introduction of Coppo di Borghese Domenichi, the man who is credited with delighting . . .
We shall concede that the narrator of this story is what we would call a Super-Hero of the Hoi Polloi. Location has just been granted us, and what a location it is! The Tuscany villa remains one architectural grandiosity still attempted with ridiculous over-priced effect in California! This female, of course, “in her day” is deemed to be “one of the fairest and sprightliest ladies that were in Florence” — the Super-Heroine of her time. We now get to the real kicker in the introduction, the set-up, and we are only on the first page! 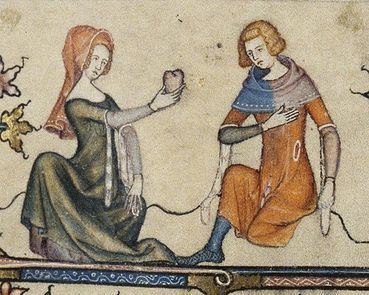 I am not quite sure what substance he spent, but I have become somewhat fatigued as I sit on my couch and read about the jousts and journeyings and whatever entertainments this young male invented to win the fair lady’s love! The beloved female at this point in the story becomes a widow. She has a son with whom she moves to the country . . . to her estate . . . not far from the poor little farm of Federigo! The lad takes to hawks and hounds and that wondrous falcon. He soon falls ill. His mother becomes sick with worry. Desperate to help her son, she beseeches him to tell her what she can do to restore his health. I shan’t reveal any more of this endearing tale and spoil the enjoyment of not only the ending but the delightful appreciation of the intriguing plot details and touching dialogue. 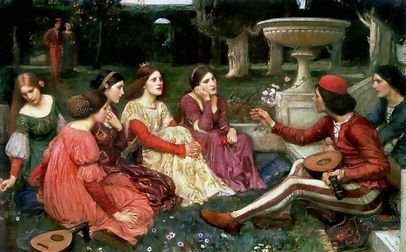 I shall state that Boccaccio knew how to weave a wondrous yarn, even one with glaring coincidence and one or two obvious plot contrivances. But why would any reader not only accept, but also enjoy this heavy a hand of improbability in a tale? One simple reason is the force of character, or character type. In this tale, we encounter a foolhardy young man who suffers from the errors of his ways. There is the possibility that the youthful male is about to learn his lesson. There is also the chance for a rewarding sentiment for the reader, especially a reader who wants the young man to learn his lesson and to reap the rewards of love and solace and joy, perhaps even his lost wealth. Redemption feels much like a humbled but magnificent bird, perhaps a falcon, in glorious flight, when the redemption pertains to both the person who has had to earn atonement and for the person who must forgive or pardon the sin. In this instance, I’m that much of a romantic to let the plot soar with a few unlikely flights from fact to create fancy. The suspension from predictable reality is balanced by the logic and symmetry of this medieval tale which, like many medieval tales, abounds with rational thought. Another reason, less simple but more undeniable, for any reader to enjoy this story is a most basic human desire. The human heart needs to feel that the odds are with the sincere of heart: good triumphs, evil fails. Those ideas are not platitudes and they are not throwaway items, except for the cynic who throws away only the good and hugs the bad in life. 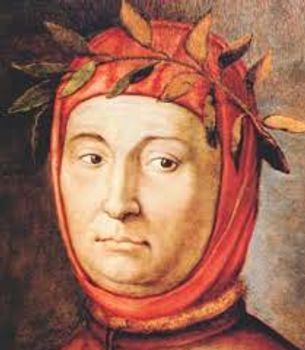 The third reason might be one that Boccaccio did not contemplate: the test of time. A tale like “The Falcon” is time-tested; it prevails as good literature and a fine, hearty read. Hundreds and hundreds of years have passed by humanity and no one can conjure a sentimental story with richer warmth of emotion, sharper ring of truth, or deeper meaning. Like a day lived happily that makes one wise, or a night slept soundly that can too often seem an elusive prize, a tale told expertly is a comfort to the soul. “The Falcon” reminds us of the dearest, the most precious, and most heartfelt lesson of life: to love is to live without limits, to perceive the radiance of a brighter day, to reach toward the noblest desires, to soar. To be able to tell a tale that inspires . . .
“The Falcon” — what a tale!